We had a bit of snow this past weekend. I guess about 3 inches. The boys had fun playing outside in it on Saturday and Sunday. Luckily it didn't interfere too much with the roads and we were able to get out every day and back to school on Monday. I guess you could say I was inspired by the snow to scrapbook a bit. On Sunday night I created this layout using photos taken during the ice storm last January. It's hard to believe that exactly one year ago we were without power and staying with my parents (who had power restored...and hot water!). I mentioned once that we were without power for almost a week. Blake was quick to remind me that it was actually six days and ten hours! 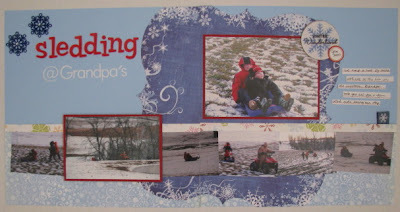 I used my new January kit from Personal Scrapper for this page. I added some older items to it also (metal snowflakes from Michael's, Li'l Davis coaster, fabric tab...and Thickers!). We could get more snow this weekend or early next week. We will have six more weeks of winter, afterall! LOVE the red, white, and blue together! !